Each task is associated with a phase of the Software Development Life Cycle (SDLC). 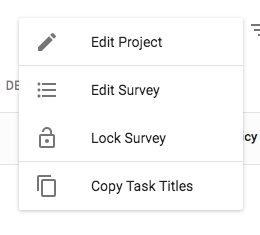 The screenshot below shows the tasks list, organized by phase. The tabs can be used to navigate between them. Refer to Default phases for more information about the default task phases. Refer to Task details, for more information on the information and badges shown for each task. "Which tasks are high priority?" "Find all tasks that failed verification"
"Show me which tasks that should be assigned to manual testers"
Click on the filter filter_list icon in the top right of the page. Use one or more of the options to filter the tasks. 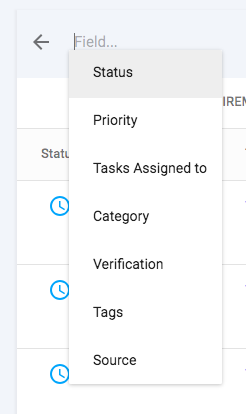 Filtering tasks by status, priority, assigned user, category, verification, tags, source, and regulation is supported. The search field can be used to search for tasks matching keywords. Click on the filter search icon in the top right of the page. Enter keywords to search for relevant tasks in the current phase. It may take up to 1 hour for the search indexing system to register updates to custom content or task changes in the project. By default only tasks relevant to a project’s assigned risk policy are displayed in the interface. Change the view so that all tasks are displayed and available to be actioned. 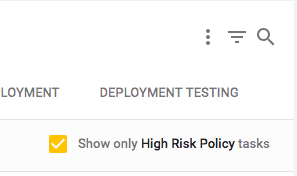 Uncheck the option "Show only Policy Name tasks" where "Policy Name" is the name of the project’s assigned risk policy. The list of tasks reloads with all project tasks. Select the more options more_vert icon. The titles are copied to your clipboard in Markdown format. Use them as a simple task checklist in other systems.